In this post we will look at how you can get more waveform bandwidth out of your waveform generator, bandwidth that goes beyond it's spec'd bandwidth. Before we get started there are some prerequisites that your waveform generator must meet for this to work. First your waveform generator must allow you to set the sampling rate for the arbitrary waveform generator versus just the frequency. Low cost direct digital synthesis generators typically only let you set the frequency for an arbitrary waveform and not the sample rate since they are not actually playing every point of the waveform just providing a close approximation of the waveform. Second the waveform generator must have a sampling rate that is greater than the 2X the spec'd output bandwidth. A waveform generator's output bandwidth is typically limited by the analogue bandwidth of its signal conditioning output stages (filtering, output amp, etc), not its sampling rate. The sampling rate of the waveform generator is typically set well above the Nyquist rate, a condition known as oversampling. 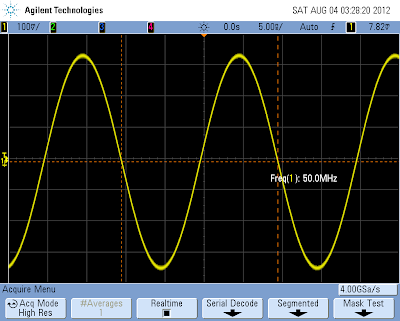 We can use the higher sample rate to create waveforms above the analogue bandwidth of the waveform generator. As an example Agilent's 33522A has a sampling rate of 250 MS/s and an output bandwidth of 30 MHz. Its built-in sine wave function only goes up to 30 MHz, but by creating an arbitrary waveform sine wave we can take advantage of the oversampling and go above 30 MHz. As an example a 50 MHz sine wave was generated with a 33522A and can be seen in the scope screen shot below. At 20 MHz above the spec'd bandwidth some amplitude attenuation will occur on the sine wave signal. For the 50 MHz signal the output measured amplitude was about half of the set output amplitude (-6 dB attenuation). But the signal fidelity of the 50 MHz signal was still well within spec. As shown in the figure below, the second harmonic was < -55 dBc (33522A spec is < -35 dBc). For what I will refer to as sine like waveforms achieving higher bandwidths by taking advantage of oversampling works well. For pulse and square like waveforms you are typically limited to the spec'd bandwidth of the waveform generator and if you try to go higher using an arbitrary waveform the result will look like a sine wave not a square or pulse waveform. 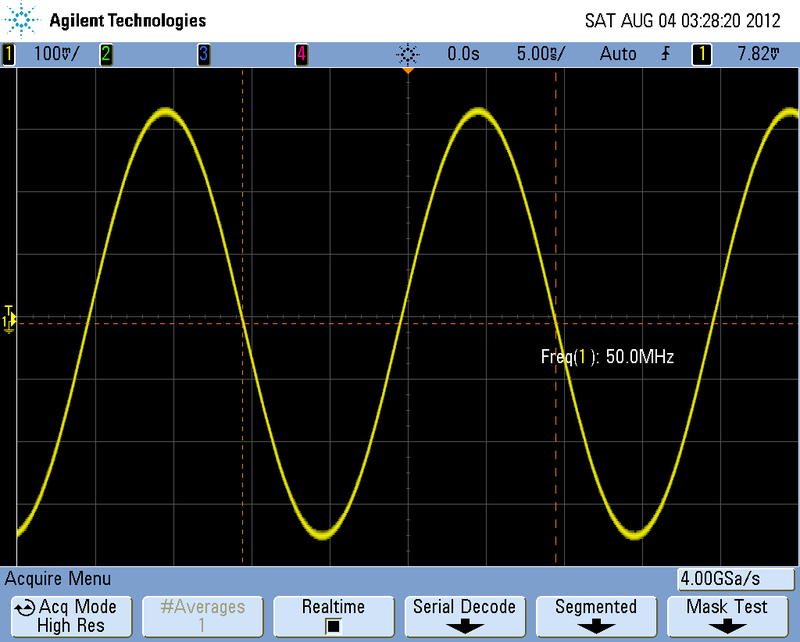 Since achieving higher bandwidths from your waveform generator using oversampling works best for sine like waveforms, it can be used for waveform applications such as multi-tone signal generation, phase or frequency modulated carrier signals, or simulating baseband digital modulation that uses a raised cosine filter. Let's look at a simple multi-tone signal example. Using the 33522A waveform generator a mult-tone signal was generated that consisted of the following tones: 10 MHz, 20 MHz, 30 MHz, 40 MHz, 50 MHz, and 60 MHz. The resulting mult-tone signal was generated by the 33522A and captured on a signal analyzer as shown in the figure below. As we would expect the amplitude of each tone drops as frequency is increased. This problem has an easy fix though. By using the marker function, the ratio of each tone can be measured against a reference tone, in this example the reference tone is the 10 MHz. The ratios were used to generate amplitude flatness correction factors in software. The new multi-tone signal with flatness correction was generated by the 33522A and measured with a signal analyzer, screen shot shown below. Using the flatness correction we were able to generate a quality multi-tone signal with a tone that was twice as much as the 33522A's rated bandwidth! The bottom line is if multi-tone signal generation or another sine wave like application is what you intend to use your waveform generator for you could save a lot of money by choosing the waveform generator based more on its sample rate instead of its rated bandwidth. And then obtaining an evaluation unit to test how much more quality bandwidth you can squeeze out of it for your particular application, before making your purchase. If you have anything to add to this post please use the "Comments" section below. If you have any questions feel free to email me. Having a good water examining kit is of the utmost importance. Proper share water examining and share care is the best insurance against share algae and other share problems. Get the best share water test kit that is easy for you and has the best readings. good attempt! (Y) (Y) my blog!